This saddle is a complex item and we like to agree the specification before the order is placed. 7. 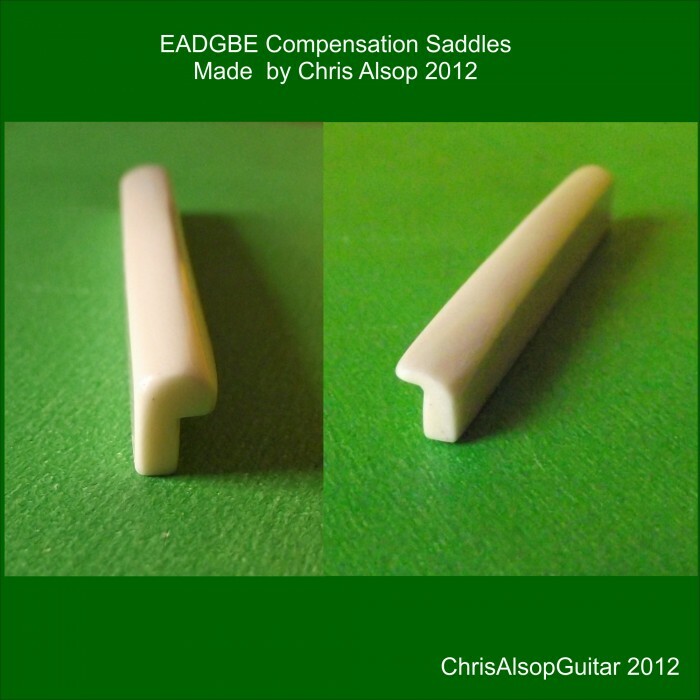 String contact details for EADGBe - this should allow the amount of overhang to be determined. 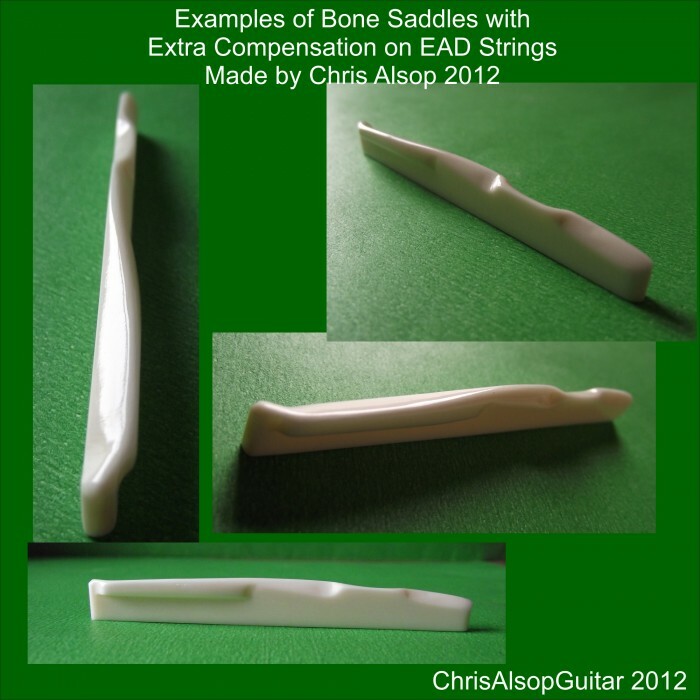 The concept here is an extension of the normal compensating saddle idea: the string contact position on the saddle is altered for each string to slightly adjust the pitch a fretted note produces. This allow the pitch of each string to be altered to cancel errors in the pitch of fretted notes (intonation problems). The main cause of error is the sharpening of the pitch due to slight stretching of the string when you press it into the fret space. 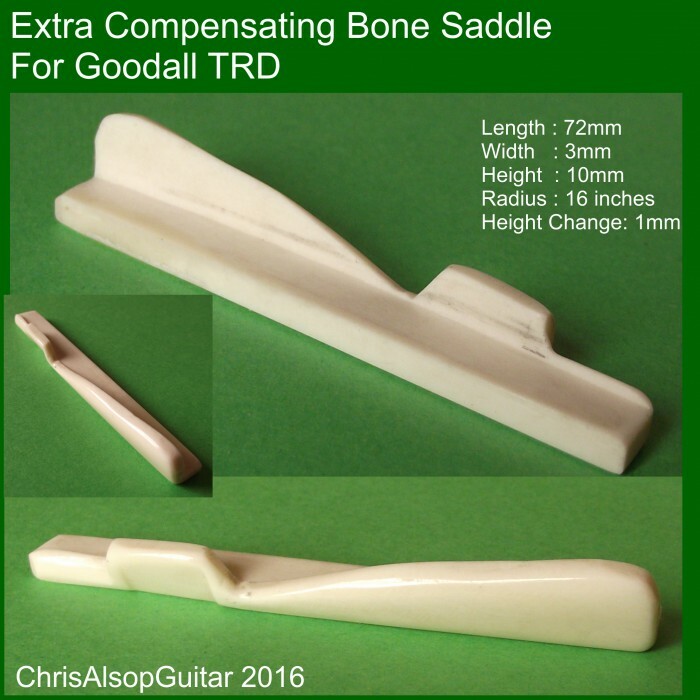 By moving the string contact point to the back of the saddle (that is the furthest from the fretboard side) the effect is to lower the pitch. 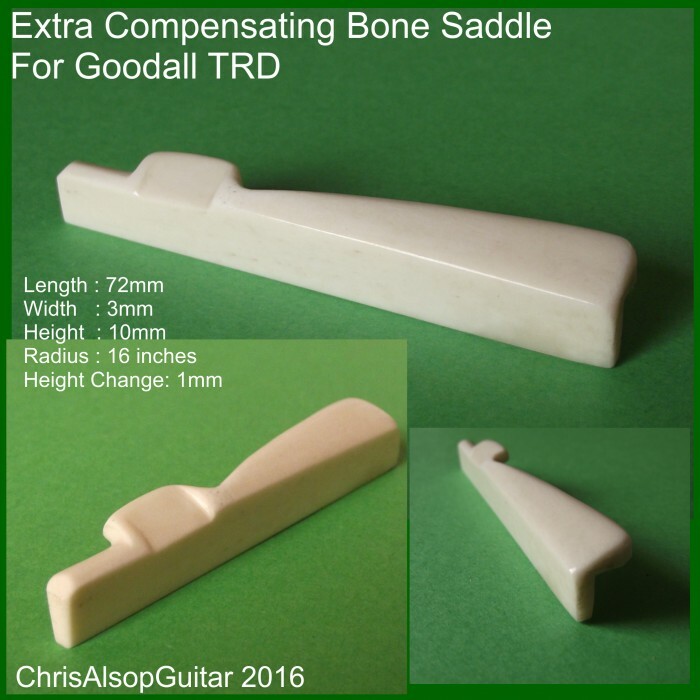 This saddle is designed so that the cancellation effect is not restricted by the saddle width itself by making the whole thing much wider at the top of the saddle whilst the base - the part that goes into the saddle slot - is the same as usual. These are designed to suit your needs and the extra overhang can be effected anywhere on the saddle , but the usual need is to move the low E and A further back as shown in the attached photo. 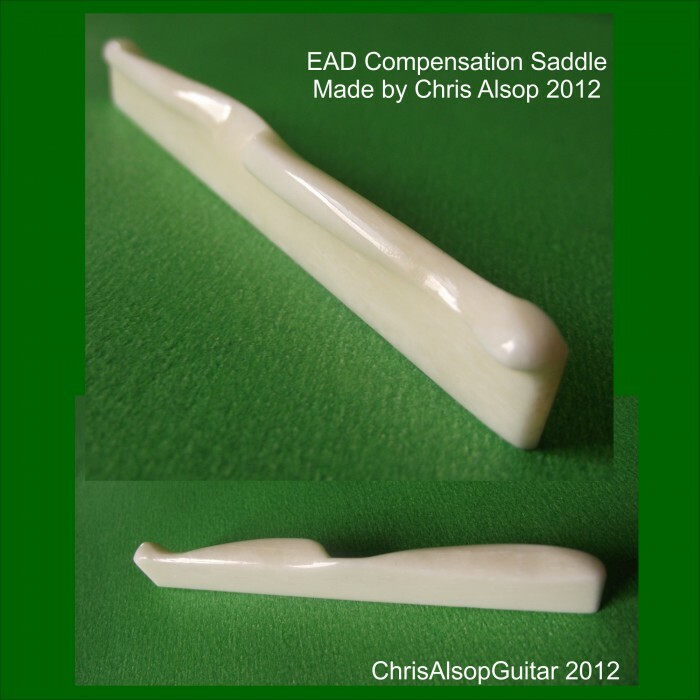 This saddle is made from high density Ox bone and is for use on 6 string steel strung acoustic guitars. We make the parts using precision measurement, numerically controlled routers, grinders and saws coupled with careful hand finishing and polishing. An accurate, high quality manufacture results. 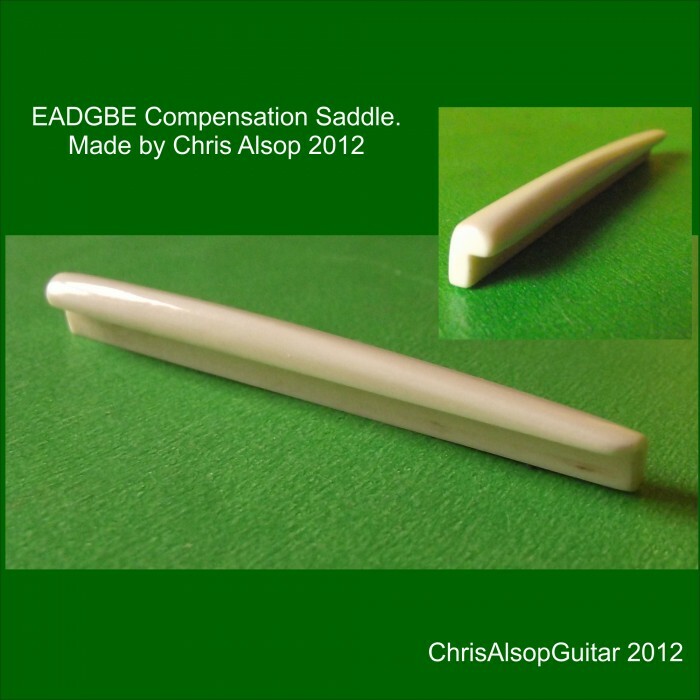 We communicate closely with the buyer to make sure we get the right specification and you receive the full benefit of our knowledge of guitar saddles.We supply a comprehensive advice sheets for fitting. 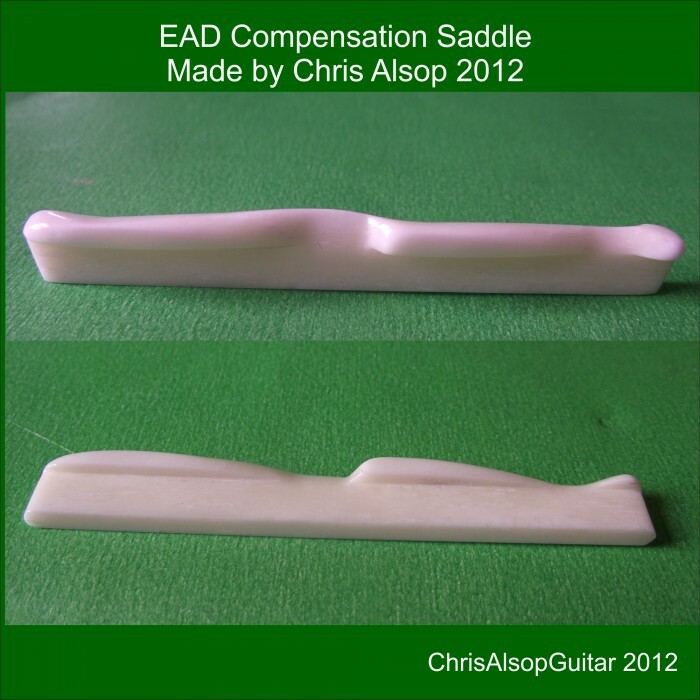 Your saddle replacement is in good hands.We have the right experience of manufacture and we know what a guitar needs to give the best tone, intonation and acoustic or pickup response. 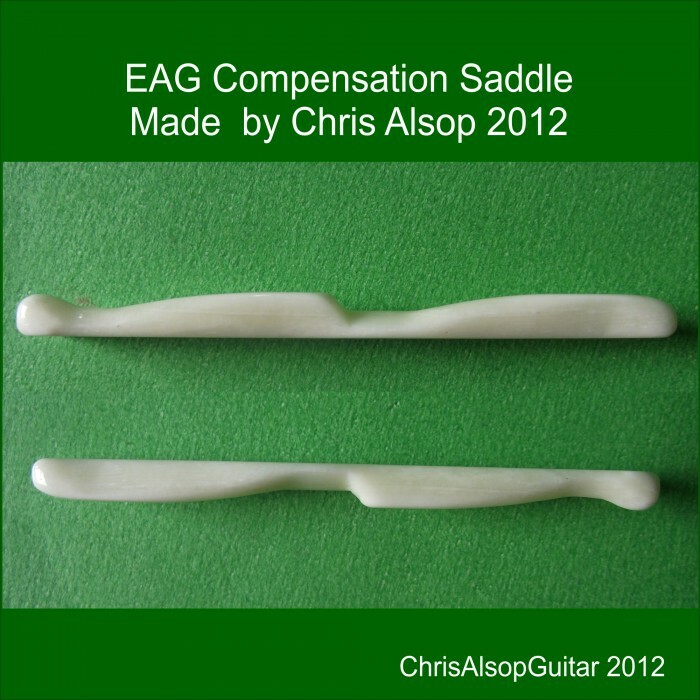 All parts are made, measured and tested by Chris Alsop.